There’s no word short of “stunning” worth using to describe a film like Contagion. To even start to unravel the complex series of scenes and intricate dance of characters that make up the film is to quickly boggle one’s mind, even though as a linear package it tells a detailed and emotionally satisfying story of a global event of nearly unfathomable proportion. There’s also no phrase short of “gigantic, steel balls” to describe what it must have required to tackle a global pandemic that threatens to wipe out a significant portion of the planet’s human population, and to do so from its beginning to its end, while filling in extensive and realistic detail in between. Finally, there’s no superlative short of “gorgeous” to apply to a story that so delicately delivers a wide range of gratifying emotional payoffs amidst such a gargantuan human cataclysm. Soderbergh has once again engineered an obvious classic that is deceptively rewarding. Something is spreading across the Earth, and it’s killing people faster than we can understand it. Beginning with a single woman traveling from Hong Kong, the virus quickly spreads across the globe and makes itself known as a threat of biblical proportion. People, families, and cities are affected without warning, and organizations across the earth quickly mobilize to try and contain and combat a disease that is clearly too advanced to be defeated before it cripples civilization itself. This is not a story of the apocalypse though– it is no easy tale of the end of the world. Even more this isn’t merely a zombie movie with no monsters. Rather, it is the grounded story of a worldwide, years-long scenario that touches every person on the planet before, as we always have historically, humanity is able to perhaps catch up, overcome, and survive. Wounded, but stronger for it. 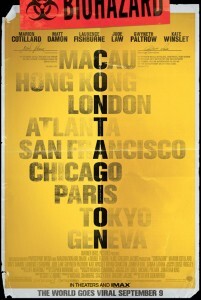 Contagion tells this story with the widest lens possible, short of simply filming the planet in time-lapse from orbit. Within the film the highest health officials coordinate, while the most cutting-edge scientists study, and the earliest responders organize. The story leaves few watershed moments in the pandemic’s path un-captured and yet you will also glimpse a small story of brave sacrifice, one of fear-driven abduction, and yet another of circumstantial greed. It’s an incredibly complex web that features a dozen familiar faces –John Hawkes, Bryan Cranston, Jude Law, Gwyneth Paltrow, Marion Cotillard, Armin Rhode, Kate Winslet, Larry Clark, Demetri Martin, Elliot Gould, Chin Han– giving their all in roles large and small. There are two primary stories driven by Laurence Fishburne, playing the highest level CDC official, and Matt Damon, the most isolated and immediately-affected citizen. Despite the film’s ruthless economy, these two characters are set-up, developed, and sent off with consistent detail throughout the film. As (or possibly more) importantly though, there are over half-a-dozen more stories waxing and waning through the rest of the movie of characters that are introduced, enriched, and paid-off in as few as three scenes, the sum of their screentime nothing compared to their relative impact. This is Soderbergh’s greatest feat: building character with stunning clarity and unbelievable efficiency. It’s a sophistication of filmmaking that retroactively empowers Scott Z. Burns to have written a script made up of laser-focused scenes that together seem scattered and episodic until you pull back far enough to see the clear, lean narrative that they’ve created between beginning and end. It’s also a stunning display of character-driven filmmaking that could only have been accomplished by a master director capable of slicing these people open and showing us their hearts, fears, and desires without wasting a frame of film. Make no mistake, Contagion is a terse movie that often unfolds in unglamorous locations like office buildings and sterile labs, but by virtue of the intriguing dialogue and character dynamics at no point does it drag. The film is very beautiful as Soderbergh (who is also credited as the Director of Photography) milks from his RED camera (with which he is now quite familiar) some of the most beautiful images of his career. This deserves to be seen on the largest screen with the best sound as much as any cacophonous mess of swords, aliens, guns, or robots that’s invaded screens this summer. The locations may be spare, but the photography is rich with deep shadows and glowing highlights. Naturally Soderbergh is unafraid to play with unusual editing techniques and to film things from odd angles and points of view. While there’s not a wasted moment of unnecessary flare, these moments –be they intimate handheld shots with off-axis focus, or tilt-shifted time-lapses– serve to cut into the characters as fast and as deep as possible, while preventing the film from growing visually sterile. Also jazzing up the rather spare environments and intense drama is a haunting score from Cliff Martinez. While the compositions occasionally tread dangerously close to outright emulation of recent work from Trent Reznor and Hans Zimmer, it contains a huge array of original sounds and novel approaches that make it its own special score. Paired with a superb sound mix, the score definitely makes Contagion as remarkable of a cinematic experience for your ears as it is for your eyes, brain, and heart. Vastly epic in narrative scale and decidedly human in emotional scale Contagion is ultimately the biggest film of the year. It’s an entertaining, mainstream thriller brave enough to inject no opera where it doesn’t belong, and no grandstanding around small moments that don’t need it. Instead it relies on the potency of meaningful actions and the audience’s emotional imagination to imbue the drama with impact. You’ll leave the theater as eager to see the film again as you will be to wash your hands and find a face mask. Featuring a nearly perfect ensemble cast and a flawlessly engineered story, Contagion will assuredly be a classic among those that can stand the cold, paranoia-inducing scenario it so beautifully captures.